David Blackwood, one of Canada’s leading printmakers and most popular artists, was born in 1941 in the outport town of Wesleyville to a family with a long seafaring history. He has been telling stories about Newfoundland in the form of epic visual narratives for 30 years. He will be joined in conversation by fellow Newfoundlander, writer, broadcaster and teacher Rex Murphy. Murphy is a regular contributor to CBC’s The National, writes a weekly column for The National Post and is the author of the book, Points of View, a collection of his columns and commentaries. 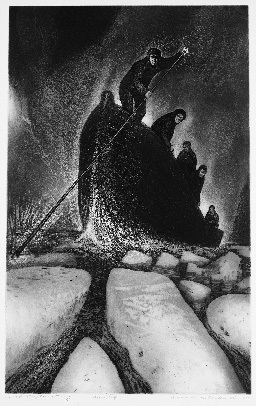 David Blackwood (Canadian, b.1941), Sick Captain Returning, 1973, etching, aquatint and drypoint on wove paper, 92.2 x 61.9 cm (imp.). Gift of David and Anita Blackwood, Port Hope, Ontario, 1999, Acc.no.99/933. © 2010 David Blackwood. It’s not every day you can get inside an artist’s mind. In the Blackwood exhibition there are three short films, all included with admission. They really give you a sense of the man, his unique etching technique, and the rock and sea of Newfoundland that inspired him. The first film dates from 1976. (Blackwood still has black hair!). It concentrates on the artist’s amazing skills as an etcher. The second features an interview conducted by Blackwood’s fellow Newfoundlander, CBC celebrity Rex Murphy (2008) and talk of the tough life of sealers and fishermen. The third, produced by the AGO, documents the artist’s 2009 trip to Bonavista Bay and the Newfoundland of his youth. The footage is mouthwatering. It makes you want to go there. Black Ice: David Blackwood Prints of Newfoundland, opens this Saturday February 5. David Blackwood is one of Canada’s leading printmakers and most popular artists. This exhibition showcases some iconic works for the first time, revealing the richness of Blackwood’s imagination and his working methods.